I’m glad my brides are as obsessed with texture as I am because this is something we will continue to see more and more. Ethical and artisan fabrics such as hand-dyed gauze, silk and luxe fabrics like velvet are set to be a big trend for 2018. Gauze, chiffon and silk runners look beautiful on tables and so do silk and velvet ribbons wrapped around bouquets in order to give them an ethereal, romantic look. I hand-dye my own runners and ribbons and will be uploading a section for these to the website very soon. Many local cake makers, florists and stationers already used them and I love seeing what they create with them. I’m a big fan of metallics and I really enjoyed incorporating brass, copper and rose gold to many of my 2017 wedding table centrepieces. However, silver, chrome and particularly glass seem to be what many brides are going for in 2018. 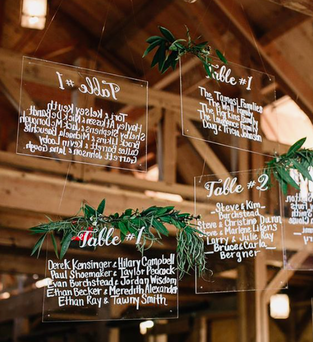 Glass and acrylics can be written on so they make perfect table plans, table numbers and displays. They’re very versatile and an elegant blank canvas to pair with any colour palette. Candles are here to stay and I can see why. Candlelight is so intimate and gorgeous; lots of coloured taper candles on mismatched candlesticks are a great way to create a bold statement centrepiece. 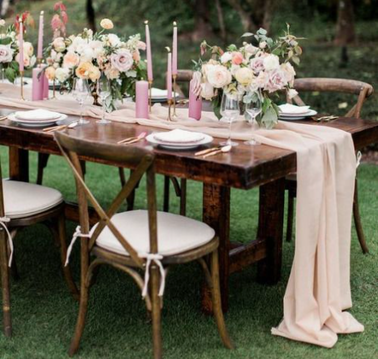 They tend to work particularly well on long tables combined with lots of foliage. I’m delighted to see that macrame will continue its popularity and will be a key feature for all of you rustic-loving, bohemian couples marrying this year. I have made lots of dream catchers using my hand-dyed silk ribbons for a wonderful bride getting married at Alnwick Gardens in the summer and cannot wait to see the result. I am also looking forward to seeing my macrame creations on a beautifully designed outdoor space at Brinkburn Priory in July. I’m seeing couples seek out more unique and architecturally interesting spaces for their wedding celebrations. There are many wonderful venues all over Newcastle, Northumberland and the North East. This year, I particularly look forward to styling some new, quirky wedding venues. The Secret Tower being one of them, a hidden gem in the centre of Newcastle with impressive views of the city and Charlton Hall, a decadent Georgian house nested in the beautiful Northumberland countryside. My final thought is that trends are there to draw inspiration from, but there’s no right or wrong when it comes to your own wedding choices. Stay true to yourself, have fun with it and if you need help, don’t hesitate to contact me on 07415067528 or email [email protected] or if you prefer you could fill this form. Here’s a link to my hire decor catalogue for more ideas.